1. Steve Johnson won in straight sets over Ernests (Sea)Gulbis in a match that was never even close — Johnson was on fire. He’s been playing some very good tennis, and should be in the top 50 when the new rankings come out. His game is one of the most watchable of all the Americans, so I’m glad he’s having some success. The match was predictably dramatic. Gulbis was shocked by an incredible, blistering backhand winner down-the-line that Johnson hit to close out his own service game. 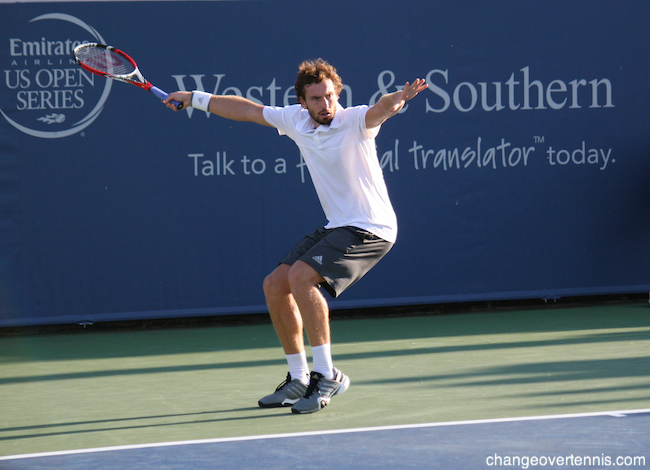 When Gulbis went to serve in the next game, he stopped and said, “I didn’t know you could hit that backhand. That’s new, huh?” It was a lighthearted moment between the two players. Gulbis was unhappy with the way he was playing, but Johnson was playing well enough to beat just about anyone. 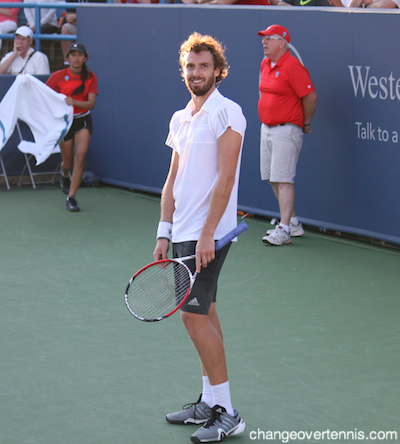 Gulbis kept giving making faces at his camp, who were sitting right behind me. A guy in the crowd started bellowing “Let’s go, Steve!” over and over between each point. He also yelled, “That Trojan pride, baby!” and “Let’s get physical!” He was driving everyone around him nuts, and a bunch of people told him to shut up. 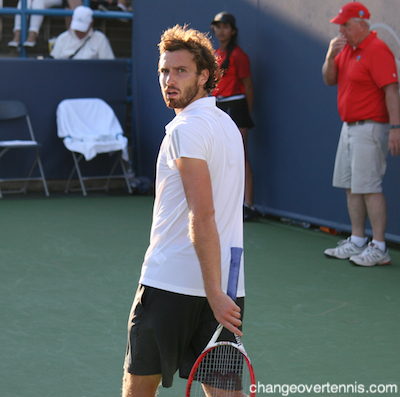 Gulbis gave him a death glare and muttered something in his direction. Gulbis fought back to get one of the breaks back in the second set as Johnson was serving for it at 5-2, but Johnson was playing too well, and easily closed it out on the second try. Great performance from the American. I like watching a lot of the new guys. Like Dimitrov. I think he’s really exciting. Q. When you started working with Patrick a couple years ago you guys had a lot of immediate success winning a lot of titles. How has this coaching dynamic changed? It’s been a more disappointing stretch for you this year. SERENA WILLIAMS: I think it’s been good still. I think it’s been a great ‐‐ we have a great relationship. It’s been a great run. You know, it’s a great challenge. We both love challenges. You know, it’s great. We want to continue to just keep going. Q. Your year was going pretty well. Curious why you felt it was time to make a coaching change. ANA IVANOVIC: You know, some decisions are not easy, you know. Sometimes you have to prevent things. You know, I was saying the other day people judge us a lot by changing coaches often. Trust me, we don’t want that. We want a person that we can work with and that we can become familiar and they know us and we know them. But sometimes it just doesn’t work. It’s unfortunate, but, you know, sometimes you have to look for what’s best for you at that moment. 5. I guess Stan Wawrinka is no Bernard Tomic fan. 6. I sat courtside for Roger Federer vs. Vasek Pospisil. 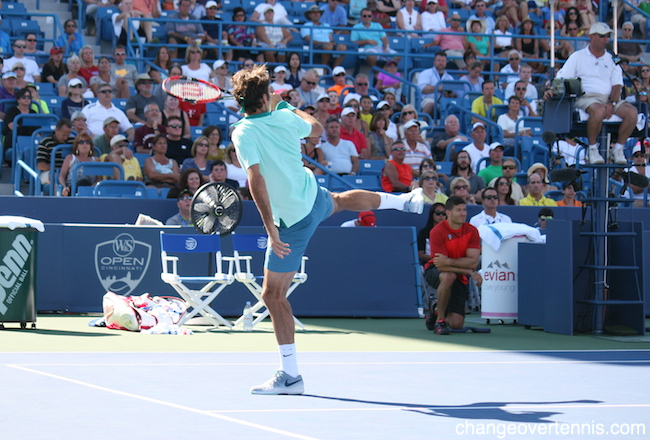 Federer was broken late in the second set with some loose errors, but managed a commanding performance in the final set. He did start grunting when he was making an effort to break Pospisil’s serve, which is something you don’t often hear. I also was laughing because he was making very soft sound effects on practice swings he took after missing a shot. It makes a world of difference seeing him this year versus seeing him last year in Cincinnati. Last year, there was a fragility he had never shown before. He was playing putrid tennis at times, and just scrapping through his matches, like the ugly three-set match he won against Tommy Haas. It was quite clear he was struggling with the back injury. This year, he’s not at his peak, but there’s no sense of foreboding watching him. The confidence is back, and he didn’t go off the rails in a potentially tricky opener. Q. Is it easy for you to take a step back and kind of have some perspective? You know, the Australian Open, weren’t coming in with a ton of form; made the semifinals. You won a title before the French. Wimbledon, didn’t have a ton of leadup. Are you able to step back and see that it’s not so bad or anything like that? EUGENIE BOUCHARD: Yeah, for sure. I mean, you know, sometimes you guys ask me the questions and then you sound more kind of negative than I feel. I’m like, Well, okay. It’s just interesting for me to note that before the French I won a title and I had to play, you know, 48 hours after. Wimbledon I lost first round the week before. You know, there is no secret recipe. So it’s just, you know, trying to do as well as you can all the time. So it doesn’t worry me if I have kind of a different leadup to a slam than I have in the past, because it’s been so different for me and I have still managed to do well. You never know what’s gonna happen. I could crash out early. But I’m not really kind of stressed about the perfect leadup. 8. Unfortunately, Petra Kvitova has not yet found any kind of form on hard courts. She fell in straight sets to Elina Svitolina, who honestly didn’t have to do much to beat the defending Wimbledon champion. Kvitova mixed in some dazzling shots with 45 unforced errors, so it was business as usual for a Kvitova loss. She’s playing New Haven, so she’ll have one more chance before the US Open to get some better matches in. Q. Do you feel like you’re hitting the ball well in practice? PETRA KVITOVA: Not really (smiling). Q. Just rhythm or timing? PETRA KVITOVA: Yeah, I feel ‐‐you know, it’s different. We change the balls again and the bouncing a little bit higher and everything. It’s just a little bit different. A little bit slower court. A lot can change in a week in tennis, as you saw with Tsonga last week, that came out of nowhere, and also this week he only won five games. A lot can happen in a week. That Wawrinka retweet was amazing.